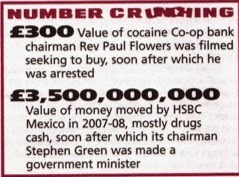 The UK satirical magazine Private Eye runs a small section in every edition entitled "number crunching." This one looks at the rather colourful and drug-fueled tale of Britain's Coop bank chief Paul Flowers, which has gained massive media attention in Britain and elsewhere, with titillating stories such as this one. The image rather speaks for itself. And yet it's hard to be sure which scandal has gathered greater media attention. For more on HSBC, read this article. Caution: hold onto your hat -- and perhaps your lunch too -- while reading. Update 2014: for background on the finance sector and enablers and intermediaries, see here.